Onion dip has a kind of bad reputation sometimes. It’s usually one of those fattening dips (such as queso, cold spinach dip, veggie dip, etc.) that involves lots of mayonnaise, sour cream, and cream cheese, the heart attack trifecta that makes dips shockingly addictive when paired with a few mix-ins and a big bowl of chips. Onion dip is often associated with stirring in a pack of onion soup mix with a container of sour cream (see here). We are here to tell you that onion dip can be so much more than that and have more nutritional benefits. 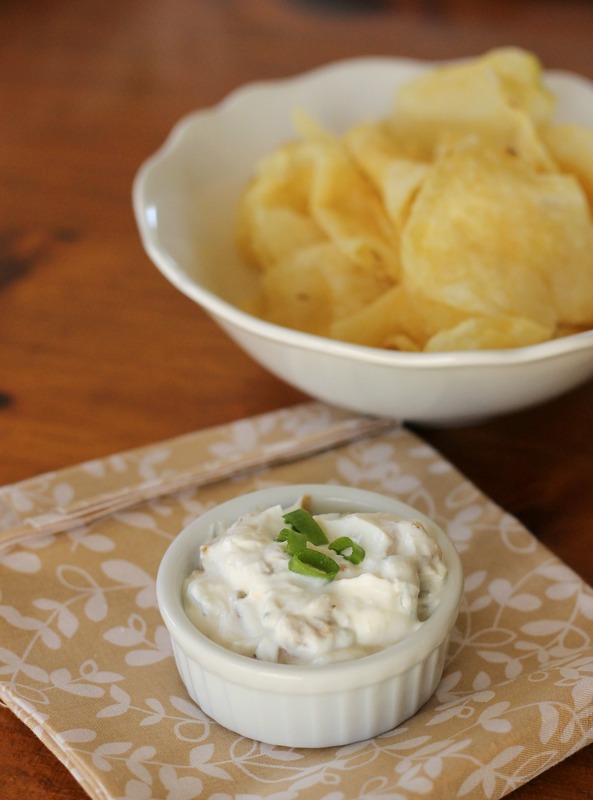 This particular dip has Greek yogurt (we promise that the final product does not taste yogurty- we tried this recipe one time with sour cream and it tasted the same), caramelized onions, scallions, a little light mayonnaise, onion and garlic powder, and a little salt and pepper. It really is a great dip, and one that you don’t have to feel guilty about eating! The first time we tried this dip, we made homemade baked smoked paprika chips to go with it. They were great, for sure, but when you have four brothers eating them, they don’t go very far for the amount of work involved. So, if you’re adventurous and only serving a couple of people, you can make them from the original recipe here, or just sub and enjoy them with a portion of your favorite chip (our are the kettle-cooked variety!). Set a nonstick skillet over medium heat and add the oil. When it shimmers, add the onion and the white parts of the scallions. Cook for about 10 minutes, stirring frequently, until golden brown and softened. Cool completely. Stir together the cooled onion mixture, the scallion greens, the yogurt, mayonnaise, garlic powder, onion powder, salt, and pepper in a medium bowl. Cover the bowl and refrigerate for at least an hour to allow the flavors to meld. Serve with chips (or if you’re being healthy, carrot sticks!). Enjoy! I could do major damage to this dip. Pretty sure dips, of any kind, are my favorite food. And those homemade baked smoked paprika chips sound amazing! I agree- dips are pretty much the best! And this onion dip was no exception.